When Magizoologist Newt Scamander arrives in New York, he intends his stay to be just a brief stopover. However, when his magical case is misplaced and some of Newt's fantastic beasts escape, it spells trouble for everyone... 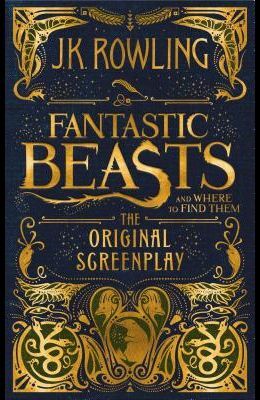 Inspired by the original Hogwarts textbook by Newt Scamander, Fantastic Beasts and Where to Find Them: The Original Screenplay marks the screenwriting debut of J.K. Rowling, author of the beloved and internationally bestselling Harry Potter books. A feat of imagination and showcasing a cast of remarkable characters, this is epic, adventure-packed storytelling at its very best. Whether an existing fan or new to the wizarding world, this is a perfect addition to any film lover's or reader's bookshelf. The film Fantastic Beasts and Where to Find Them will have its theatrical release on November 18, 2016.